Surfaces and Interfaces: Surface of a material is the host to a number of activities including chemical, optical, electrical, electronic and magnetic interactions. This is because, atoms on the surface encounter a different environment than that of their bulk counterparts. Atoms inside the bulk of a material are surrounded by similar/identical geometric configurations; on the other hand, atoms on the surface, are being attached to the material on one side by either chemical/physical bonding, the other side is free. The absence of neighbouring atoms on one side results in an imbalance in the force experienced by the surface atoms. In such a scenario, the surface atoms try to find an equilibrium structure which is different from that of bulk. This could happen in two ways: relaxation and reconstruction. Normally in metals, in-plane atoms on the surface try to increase their inter atomic distance, and also interlayer spacing (relaxation). These changes in inter-atomic and inter-layer distances decrease and tend towards standard bulk values as one move deeper inside the materials (bulk). But in some materials, normally in semiconductors, atoms on the surface assume entirely different structure from that of the bulk, to compensate for the absence of neighboring atoms. This is called reconstruction. In essence, there is a lot of activity happening on the surface, and if one can increase the number of atoms on the surface compared to bulk, activity of a material increases manifold which leads to drastic changes in chemical, thermal, electrical and many other physical properties of a material. This is what exactly happens in nano materials!!! Changes in properties can largely be attributed to change in surface to volume ratio as more and more number of atoms occupy the surface and more often than not this and the resulting quantum size effects makes these nanoparticles more active to its surrounding environment. Most of the research going on now-a-days is to modify and tune these properties so that it could be useful to mankind via medical, energy related and catalytic applications to name a few. Another scenario is when the surface of material is attached to another material. The resulting interface also throws up a lot of interesting physical phenomena wherein, atom on one surface tries to bond with a different atom leading to interface relaxation, epitaxial growth and even formation of defects. So, fundamentally, surfaces and interfaces of materials are one of the most exciting area of physics and the detailed structural and chemical study of such surfaces/interfaces would help us in understanding a host of material properties which are important in energy, environment related applications. Three of the major areas being looked upon in this lab are multilayer thin films for energy applications, embedded nanostructures in insulating matrices for opto-electronic applications, and tuning nanoparticle orientations to increase their surface activities. 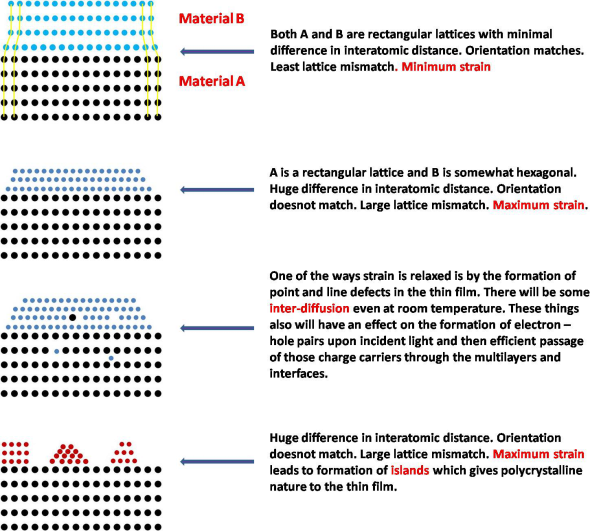 When a system comprises of surfaces and interfaces, there are lot of potential activities happening at the interfaces as well on the surface (as explained in the figure below). In such cases orientation of the substrate plays a very important role. For example, when gold thin film is deposited on a Si(110) substrate, the gold-silicon interface tries to arrive at a minimum energy configuration which influences the final morphology of the thin film itself. Moreover, if the system is subjected to higher energy (heating), interface mixing takes place, leading to drastic changes in surface morphology which is hugely influenced by the orientation of the substrate. Studying such interfaces involving Semiconductor/Metal Oxide/Metal thin films is one of the projects being undertaken in this lab. Here, selected metal oxide thin films is being deposited using various Physical Vapour Deposition techniques (including Thermal, Pulsed Laser and Magnetron sputtering deposition) and then analyze whether orientation of the deposited thin film has any effect on its optical, chemical and structural properties compared to randomly deposited thin films, right down to nano/atomic level. Light absorption/conversion efficiency of semiconductor nanostructures mainly depend on five major criteria. First and the most obvious one will be size of the nanoclusters. Apart from that, embedding matrix, amorphous/crystalline nature of the nanostructures, presence of surface and interface states, shape of the nanostructures also have substantial effect on light absorption property. Si and Ge quantum dots (QD) are the major elemental species being explored; especially Ge QDs have received renewed interest in recent times because of larger bulk absorption coefficient, larger exciton Bohr radius, which makes band gap tuning easier, and lower. synthesis temperature among others. In this project, the objective is to study the matrix-QD interface, effect of inter QD distance and process of agglomeration of Ge ions into Ge nanocrystallites at high temperatures in-situ. Low energy elemental ions will be implanted in dielectric matrices. Process of incident ions agglomerating into amorphous/crystalline nanostructures and then the structural and chemical properties of Ge/SiO2 and Ge/Si3N4 interface shall be studied in detail. Apart from reducing the size of a material to increase number of surface atoms, crystalline orientation of a nanostructure also plays an important role in defining its physical properties. It is well known that the surface activity of a nanocrystal essentially involves interaction of surface atoms with surroundings. The ease with which, making and breaking of chemical bonds that take place between the surface atoms and the surrounding environment depends on surface crystalline orientation. This is because, number of reactive sites on the surface (ex: dangling bonds) varies with crystalline orientation. 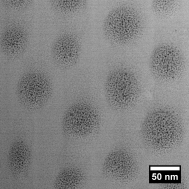 So, apart from reducing the size of the nanoparticles, the morphology of nanoparticles can be tuned. This leads to the exposure of the most active surfaces. The main aims of this project are in identifying specific metal-oxide systems and tune their shapes to increase their surface activity and thereby catalytic efficiency. Coherently embedded metal nanostructures (endotaxial) are known to have potential applications concerning to the areas of plasmonics, optoelectronics and thermoelectronics. Incorporating appropriate concentrations of metal atoms into crystalline silicon is critical for these applications. So, choosing proper dose of low energy ions, instead of a depositing thin film as a source of metal atoms, helps in avoiding surplus concentration of metal atoms that diffuses into the silicon crystal. In this work, 30 keV silver negative ions are implanted into a SiOx/Si(100) at two different fluences. Embedded silver nanostructures have been characterized by using planar and cross-sectional TEM (XTEM) analysis. Potential application of carbon nanotube core as nanocontainer and nanoreactor for the encapsulated nanomaterial. PK Tyagi, R Kumari, UM. Bhatta, RR Juluri, A Rath, S Kumar, PV. Satyam, SK. Gautam, and F Singh. Nuclear Instruments and Methods in Physics Research Section B: Beam Interactions with Materials and Atoms (2016) 379:181. IF: 1.109. Fe3C-filled carbon nanotubes: permanent cylindrical nanomagnets possess exotic magnetic properties. Reetu Kumari, Lucky Krishnia, Vinay Kumar , Sandeep Singh, H K Singh , R K Kotnala, R R Juluri , U M Bhatta , P V Satyam , Brajesh S. Yadav, Zainab Naqvi, Pawan K. Tyagi. Nanoscale(2016) 8:429. IF: 7.367. Electron irradiation induced buckling, morphological transformation, and inverse Ostwald ripening in nanorod filled inside carbon nanotube. A Singha, R Kumari, V Kumar, L Krishnia, Z Naqvi, AK. Panwar, UM Bhatta, A Ghosh, PVSatyam, PK. Tyagi. App. Surf. Sci. (2016) 360:1003. IF: 3.150. Engineering of nanoscale defect patterns in CeO2nanorods via ex situ and in situ annealing, TS Sakthivel, DL Reid, U M Bhatta, G Möbus, DC Sayle, S Seal, Nanoscale (2015) 7:5169 IF: 7.367. Automatic Polishing Machine for finer polishing surface on Metallographic, Ceramic, Geological Samples. A precision section saw designed for cutting all types of materials. Umananda Bhatta obtained his Ph.D in Physics from Institute of Physics (IOP), Bhubaneswar affiliated to Homi Bhabha National Institute (DAE undertaking). During his Ph.D he was instrumental in developing in-situ heating facility at IOP, Bhubaneswar, during which period he did an extensive study on temperature dependent behaviour of Au thin films on various Si substrates. After completing his PhD, he got selected to work on an Engineering and Physical Sciences Research Council (EPSRC), UK project, and undertook his postdoctoral research at the Department of Materials and Engineering, University of Sheffield from 2010 to 2013. During this time, he worked on a project titled, “Building Ceramic Metamaterials from Nanoparticles: A combined Modeling, Tomography and In-situ Loading Study” a part of EPSRC project which involved collaborations with several other distinguished Universities from UK and USA. During his postdoctoral stint, he played a key role in studying the surface properties of ceramic nanomaterials using advanced electron microscopy techniques, including Aberration Corrected Microscopy, Nanotomograpy, Electron Energy Loss Spectroscopy (EELS) and Nano indentation among others. His major specialization include, Advanced Electron Microscopy and associated techniques and has vast experience in other domains of experimental surface physics including X ray diffraction, X-ray Photoelectron Spectroscopy, Ion Beam Synthesis and Characterization. His main research interests include, studying Interactions at surfaces/interfaces of different nanomaterials/hetero epitaxial thin films, Ion beam synthesis (IBA) and characterization and in-situ thermal and mechanical studies of nanomaterials. Umananda was invited to KEK accelerator Centre, Tsukuba, and Nagoya University, Japan during 2007 summer as a part of bilateral exchange programme, during which he did an extensive work on X-ray irradiation of Polymer thin films. Dr Bhatta has more than forty five publications in various peer reviewed international journals, including Elsevier, ACS, APS, IoP, RSC among others. He has his research published in high impact factor journals with an average impact factor of more than 4 and the highest Impact Factor so far being 13.3. He has more than 500 citations to his credit with h-index of 13. During his brief research carrier of about 13 years, as an experimental physicist, he has presented papers in many National and International conferences including prestigious MRS Fall meetings at Boston (2011, 2012). He has been an active member of Electron Microscopy association of India (EMSI). Recently he has been the recipient of DST Young Scientist Research Grant and awarded a project in collaboration with DAE and funded by UGC-DAE, CSR. Currently Umananda is working as an Associate Professor. 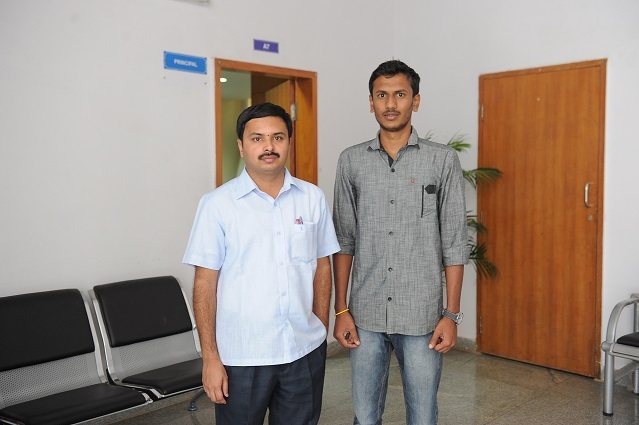 Nagabharana R M obtained his M.Sc., in Physics (2017) from the Bangalore University, Bengaluru and started his carrer as Assistant Professor (Physics) in K.S School Of Engineering (2017-2018). He joined Surface and Interface group at CIIRC in 2018 as a Project Assistant, funded by SERB-DST. His research area includes fabrication of Si-TiO2 /ZnO thin films and their characterization using optical and advanced Transmission electron microscopy techniques. He also has hands-on experience in using XRD (Bruker D8 Advance Eco) for powder and thin-film samples. Susheel Kumar G obtained his M.Sc., in Physics (2018) from Bangalore University, Bengaluru and joined Surface and Interface group at CIIRC in 2018 as a Project Fellow, funded by UGC-DAE CSR, KC Collaborative Research Project. 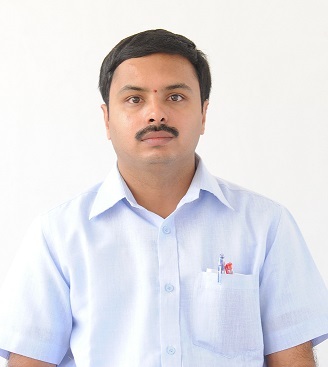 He has experience of using XRD “BRUKER D8 ADVANCE ECO” for powdered and thin film samples. His main research areas include synthesis of embedded nanostructures using low energy ion implantation, Electron Microscopy of nanostructured materials, surface/interface characterization and computational material science.